ictured at the awards presentation, from left: Zane Heydenrych (Channelwise), Mahomed Cassim (Esquire Technologies), Mark Davison (Channelwise) and Asgar Mahomed (Esquire Technologies). 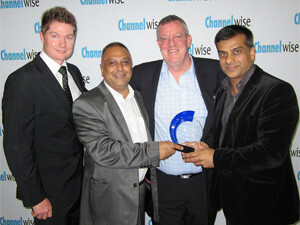 Esquire Technologies, the digital lifestyle focused IT distributor - and the 2012 African Distributor of the Year - has won the ChannelWise 2012 Peripheral Distributor of the Year Award, held at a glittering gala event at Vodacom World, Midrand, last night. The overall ChannelWise Top Distributor Award was a closely contested affair and featured the giants of the industry, with Esquire Technologies finishing in third position. In other category awards, Esquire was ranked second in the Personal Computers category, third in the Software category, fourth in the Servers and Storage category and in the Smartphone and Tablet PC category - with its locally designed Geeko Tablet PC. Esquire also managed a fifth position in the Mobile Computers category. "Up against the captains of the industry we were humbled that our value-added resellers voted for us and that our innovation and excellence have been recognised through multiple nominations - and the winning of the Peripheral Distributor of the Year Award," said Asgar Mahomed Managing Director of Esquire Technologies. Mahomed said Esquire's development and nurturing of strong alliances with its SME resellers is a further demonstration of the company's contribution to the South African economy. "Esquire works closely with these resellers and assists them to grow their businesses by bringing in innovative, cutting-edge technology from global markets, such as the USA, Europe, Middle East and Pacific Rim. "Esquire has consistently achieved a strong financial performance, demonstrated by a steady growth year-on-year, with a strong emphasis on peripherals and gadgets for our channel. "Winning an award such as the Distributor of the Year for Peripherals, and competing head-on with other players in the distribution business, highlights the fact that Esquire is doing something right when it comes to adopting an easy and convenient way of doing business, strong technical know-how, a high level of stock availability, good reseller engagement, solid sales growth - and the ability to respond to new market developments and trends in the channel. One of these innovations has been the launch of the world's first Virtual Reseller Network (VRN), which has been a phenomenal success. "We also realise the responsibility that comes with winning such an award as we now have to work that much harder to achieve the results for all stakeholders on this bold project going forward," Mahomed added. Commenting further, Mahomed said: "This award is dedicated to our staff, who have played a pivotal role in enabling the company to be recognised for its efforts in serving its reseller channel customers." Mahomed Cassim , CEO of Esquire, said: "To win this significant award is clearly testimony to the company's success in providing quality peripherals and products to our reseller base. It's humbling to win and be nominated for these important awards - and get the recognition for our commitment to the channel." Esquire Technologies is a premier distributor of IT components, desktops, notebooks, peripherals and digital lifestyle products in southern Africa. Esquire distributes world-renowned brands to resellers, distributors, system integrators and system builders in South Africa, Mozambique, Namibia, Swaziland, Zimbabwe and Zambia. Esquire strives to deliver global Tier 1 technology products at the best price in the fastest turn-around time to local markets. Esquire is a truly South African-owned black empowerment IT company, committed to the upliftment of its staff and the broader South African community.